The 4FRNT Raven is one of our favorite touring skis, and we’ve just added an update from reviewer Eric Freson for a fresh perspective on the ski. (1) The Raven received one of two ‘Best Of’ awards that we handed out for touring skis in our 16/17 Buyer’s Guide. And then it received Best Of awards in our 17/18 and 18/19 Winter Buyer’s Guides. Because even after the touring market has evolved over the years, the Raven continues to stand out. (2) We also wrote a glowing report in our initial Flash Review of the Raven, and pretty much every impression we wrote about in that Flash Review has been confirmed with more time on snow. Jonathan Ellsworth on the 4FRNT Raven. The dual radius made the ski feel unbalanced on edge. The full-width isolated carbon laminated segments of the tip and tail were throwing off the even-flexing feel of the ski. The ski wasn’t light enough. It was only offered in a 184 cm length, and that was too short for some skiers. So In response, we introduced a new 190 cm length in year 2 with a singular, 29 meter sidecut with the same construction. 14/15: 184 cm Raven, with dual sidecut geometry + carbon tip and tail. 15/16: Same 184 cm Raven, but we introduced the 190 cm Raven — but with a single geometry — and both the 184 cm and 190 cm models were built with the first year Raven’s carbon tip and tail. 16/17: New 184 cm Raven – the 184 now has the single geo mould, so gets made to ski like the 190 cm Raven. We also introduced a new lightweight core and laminate construction, now with full-length carbon stringers tip to tail, and no longer edge to edge. 17/18: The 184 cm and 190 cm Raven are the same as the 16/17 Raven. For the 18/19 season, 4FRNT moved factories and added a 177 cm length option for the Raven, but they assured us that the ski’s design has remained unchanged. Jonathan Ellsworth (5’10”, 175 lbs): While the Raven has a very accessible tip, the ski gets quite stiff through the middle, and softens up a bit through the tails. The tails are still pretty stout, but they are not eyebrow-raising stiff — in all of my time on the Raven, it’s never struck me as a particularly stiff ski, and certainly not a demanding ski. At all. This flex pattern just works, and it works perfectly in concert with the shape and rocker profile of the ski. Eric Freson (5’10”, 170 lbs): The flex pattern of this ski, especially for its stated usage (backcountry / touring) just flat out performs. It’s a ski that you can stomp on, while still being forgiving enough to enjoy at slower speeds and tighter terrain. 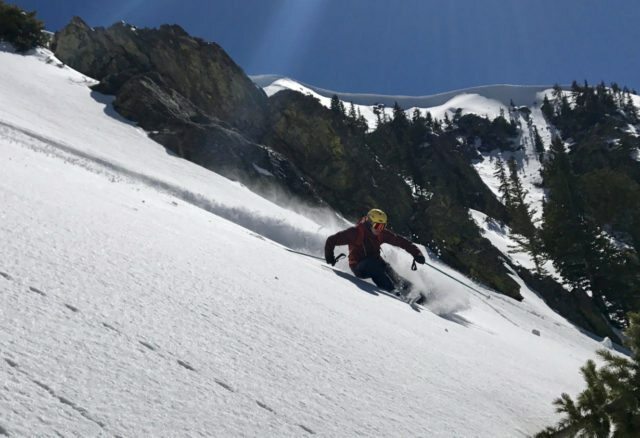 Jonathan: This is a pretty straight ski, and I’ll say more below about why I (and reviewers Paul Forward and Brian Lindahl) tend to like straight ski shapes in the backcountry. The tip of the ski exhibits very little tip taper (another bonus, in my opinion), but there is a long, subtle amount of taper at the tail — the widest point of the rear of the ski 26-27 cm from the end of the ski. So it’s a long, subtle tail taper, and we never found the ski to lack support or stability, which can become an issue with more heavily tail tapered + tail rockered skis. Speaking of rocker, the Raven has a pretty subtle and quite beautiful tail rocker line. The tip rocker line is less subtle, which is probably a good thing — and one of the reasons why the Raven fairs pretty well in deeper snow. Eric: Sometimes you find skis that have such dramatic rocker profiles that it makes skinning a chore — your contact patch with the snow can become so small that the traction your skins can create is limited. But despite its reverse-camber design, I did not have any issues with Raven on the skin track. Its shape also seems to lend itself well to walking, as I rarely find myself catching the tapered tails on each other. Finally, the Raven’s subtle tail rocker / splay and tail cap make it easier to plant the Raven vertically in the snow compared to skis with more tail splay / twinned tails. This is particularly nice when building anchors or placing the skis in sketchy spots while on a steep slope. So What’s the On-Snow Result? Jonathan: The Raven is a very easy ski to ski. It is also proved to remain remarkably predictable in really horrible conditions, i.e., chewed-up, bulletproof coral reef. On the particular day I’m speaking of, this was awful snow, and it was horrible skiing. But the flat camber underfoot and solid flex profile of the Raven made it easy to avoid having the ski hook up unwantedly in these conditions. And in warmer, weird, punchy / grabby conditions, the Raven’s rocker profile also makes skiing pretty predictable and easier than it would be on skis with a lot of camber underfoot and very flat, fat tails. Eric: I agree that this is a very forgiving ski, especially given how much stability it offers. 4FRNT seems to have really figured out the Raven’s sidecut and rocker profile to maximize the utility of this ski in a wide range of conditions and speeds. I’ve found the Raven’s easy and intuitive feel to be especially beneficial in situations where you need to be thinking about things other than your skis (e.g., making turns above a cliff you will rappel over mid-line while looking for your belay point and staying abreast of sloughing snow). 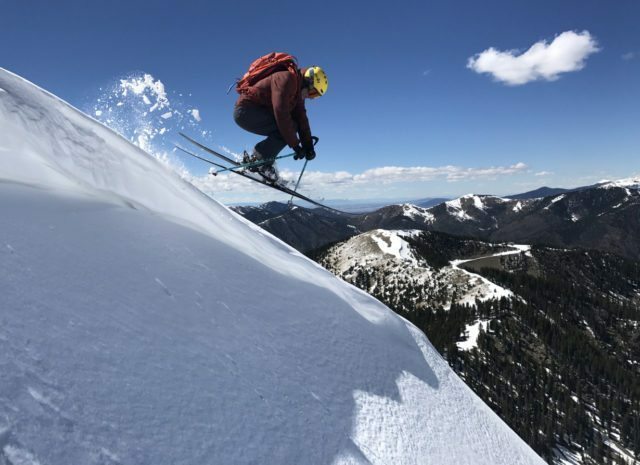 Being able to trust that the ski will exhibit predictable behavior — regardless of the conditions it might encounter — is not only confidence inspiring, but rather essential when skiing in technical, complex terrain. The shape and flex of the Raven also make it’s incredibly easy and natural to shed or build speed mid-run. Should you find yourself in a situation requiring either, the Raven is happy to respond accordingly. It’s easy to hold both a long slarve which can shed momentum / speed, or quickly point down the fall line and maintain stability and speed through variable snow. This combo allows you to focus more on terrain and snow management while on slope compared to a ski that requires more user input and concentration to accomplish the same objectives. One area where the Raven’s flex, shape, and rocker profile do hamper its performance is when you need to shed speed quickly in tight spaces on firm snow. Its lack of effective edge on firm snow, coupled with its stiff flex underfoot can make it more difficult to rein things in very quickly on very firm / icy snow. 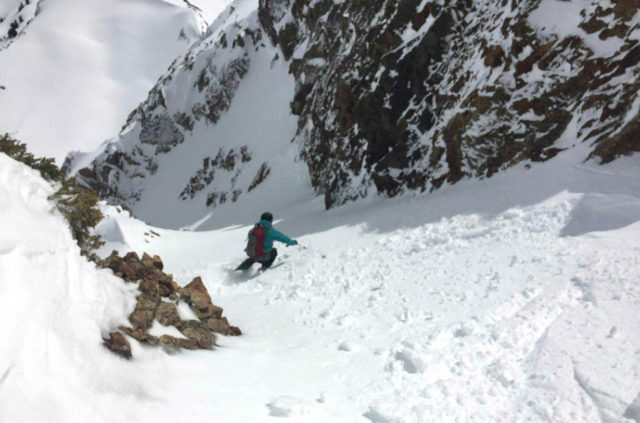 So if you’re looking for a ski that you’ll primarily use for tight, steep, icy couloirs, you’d probably be better off with another ski (e.g., Salomon MTN Explore 88 or 95). But for an all-round backcountry ski, the Raven is excellent. Jonathan: Those of you who insist on skiing lightweight skis inbounds should have the Raven on your radar. And especially if (sigh) the trend continues for inbounds skis to become lighter and lighter, then in a year or two, the Raven will look even better as an inbounds tool. For my money, however, if you took the exact shape of the Raven, built it with heavier materials, and bumped its weight up from ~1750 g per ski to, say, 2150 g per ski … I would be extremely interested in the Raven for inbounds duties. Of course, 4FRNT is already making a somewhat similar ski called the Devastator, and you might want to check it out. But while going lightweight with your skis when you’re lazily riding chairlifts can be a very overrated thing to prioritize, when you have to drag those skis up a skin track, that’s a different story, and we are always looking for skis that offer the best combination of low weight + downhill performance. And that’s where the Raven is hard to beat. Eric: Having skied the Hoji, Renegade, Raven, and Devastator inbounds, none of these skis would be on my list for a resort quiver of one. In all instances, the skis’ shapes and flexes are excellent, but their lack of traditional camber makes for a more challenging ride on firmer conditions where so much of your edge pressure and bite comes from the area immediately underfoot. In soft conditions, I would happily reach for the 184 or 190 Raven as a resort ski, and I feel that, except for moments of #maximumattack, you could be well served by the Raven as a 50/50 or very light inbounds ski for soft snow. Jonathan: I’m glad you asked. But the reality is that in really nice, light pow or on really smooth, clean chalk, you will pay far less of a penalty for being on a lightweight ski. So in a beautiful, fresh, 12-24” of powder, there are any number of ~105mm-wide skis with tip and tail rocker that are going to allow you to have an amazing day. But far fewer skis can come in at ~1750 g per ski, perform wonderfully in good conditions, but then also perform as admirably as the Raven in less-than-wonderful conditions. And that’s why I’ve spent so much time above talking about the less-than-wonderful stuff. (1) Don’t over-taper the tip. The lighter you go, the less tip taper that ski needs. (3) Relatedly, you don’t need much sidecut. Again, unless you ski tour with slalom gates tucked away in your backpack and you set a course as you move up the mountain. (4) Give the ski a nice, solid flex pattern. Especially with this shape, you’ll create a big sweet spot for the ski, and make the ski easy to stand on (as opposed to feeling like you’re struggling like mad just to maintain your balance) when conditions go variable — or horrible. Eric: The Raven can sometimes make you wonder why you reach for a fatter ski in soft and deep conditions. Great float, good speed, and excellent stability for its weight make for a lot of fun when the conditions are soft. The tip and shovel of the ski offer a great combination of compliance, forgiveness and support, giving you time and the on-snow feedback about to let you react to the snow and terrain you will encounter. I.e., the Raven’s predictability lets you focus on the line ahead, rather than needing to focus 100% on every turn. Compared to something like the Renegade, the Raven requires less input and is less demanding in the varied conditions you might find on different aspects and elevations, making the Raven more forgiving in variable conditions. If I know conditions are going to be variable, I’ll reach for the Raven over the Renegade. A testament to the general usability of the Raven can be drawn from my experiences skiing it in different boots. In the Scarpa F1 (a capable but softer-flexing boot), I was able to maintain control of the ski in a wide range of conditions and never felt as though the ski was the one in the driver’s seat. The Raven didn’t force me to ski powerfully to be in control. It was, however, easy for me to “out-ski” the F1 with the Raven, as the ski could handle more energy / force than the flex of the F1 could. In a stiffer and heavier boot such as the Dynafit Vulcan or Salomon MTN Lab, the Raven again felt like a good match, even if I chose to really flex both the boot and the ski. The Raven has the adaptability to accommodate different skier types and equipment choices in a way which not every ski exhibits. (1) If you are often ski mountaineering on steep, super firm lines, then you have very good reasons to want a fat, flat tail and some (or a bunch) of traditional camber underfoot. I have yet to get the Raven on top of any super steep, super firm lines, and to be honest, I think the ski would perform okay (and predictably) on such lines. But the fact is, this design would not be my first choice. I’ll take the additional bite you’d get from a fat, flat tail and some traditional camber underfoot. (2) If you really like to make a lot of turns — or if you are looking for a ski to be used inbounds and out of bounds — then the Raven is probably not the ticket. The Raven is straight enough and has a solid enough flex pattern that it definitely does not want to carve turns at slow speeds. I tried this a few times on different days, and it just doesn’t work. While you can pretty easily smear shorter turns on the Raven, to genuinely carve turns, you’ll need some speed and be okay making bigger shapes — and then, the Raven excels. I happen to like making bigger turns at speed, so once again, the Raven is a good match for me personally, but your preferences may lean the other way. Jonathan: Reviewer Brian Lindahl and I (who are both about 5’10” and ~175 lbs) have been quite content with the 184s — especially for touring — and we also think that advanced, much lighter skiers won’t have any problem handling the 184s. But if you are on the fence w/r/t sizing, while we are pleased with the stability we’re getting out of the 184 Raven, none of us believe that the 190 will be a bear, and we wouldn’t caution you against sizing up if you are inclined to. Eric (5’10″, 170 lbs): I’m another satisfied customer with the 184 cm Raven. Its one of the shortest skis I have been on in some time, and while I did initially get a bit hung up on that number before I had a chance to ski it, the on-snow performance is in no way lacking, and I haven’t found myself looking for “more” ski. The Raven has checked my preconceived notions about what I needed in overall ski length, and I have come to enjoy the shorter 184 cm’s benefits. 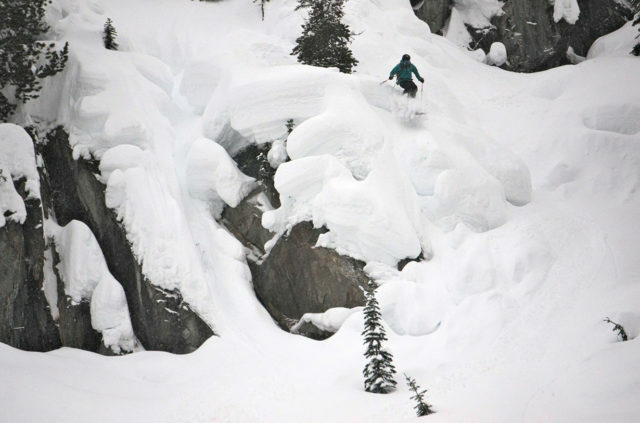 Kick turns are easier, there’s the drop in weight associated with a shorter ski (including smaller skins), they’re easier to transport on a backpack or snowmobile, and most notably, there’s the increased maneuverability when things get truly narrow or steep. Jonathan: The 4FRNT Raven is a dialed-in touring ski that was clearly designed with backcountry skiing first and foremost, as opposed to being an inbounds ski that was simply put on a diet. It is easy to ski, yet it also holds up as well as anything we’ve skied at this weight to hard, aggressive skiing. It’s probably not really Eric Hjorleifsons’ style, but he and 4FRNT could have easily named this ski the Mic Drop. 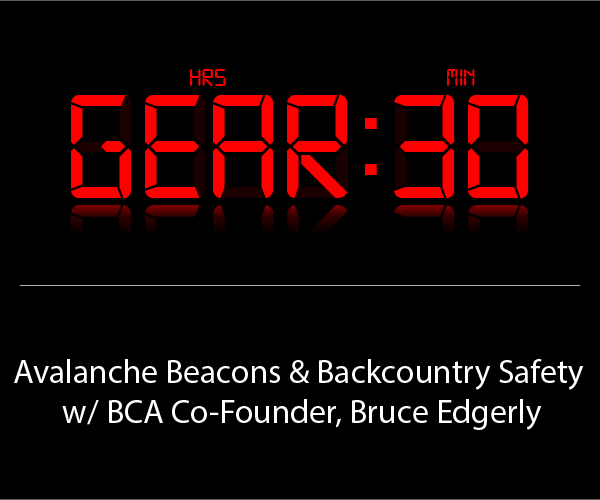 Eric: If you’re looking for an everyday backcountry-specific setup, it’s hard to think of something I would recommend over the Raven. It offers excellent soft and firm snow performance for its width, no unpredictable tendencies, it’s lightweight for its size, and above all, it’s an ability multiplier for the skier. It manages to be both approachable and simultaneously that devil in your ear encouraging you to push it just a little harder. Become a Blister Member or Deep Dive subscriber and check out our Deep Dive of the Raven to see how it stacks up against the HEAD Kore 105, LINE Tourist 102, Volkl BMT 109, Black Diamond Helio 105, Blizzard Zero G 108, Faction Candide 3.0, Salomon QST 106, and G3 FNDr 102. Great review Jonathan, worth the wait. If I hadn’t a 95mm (Salomon MTN) and a 115mm (Bibby Tour) touring ski, I would want THIS. Thanks, Lukas. And yes, I’d say that particular two-ski quiver has you covered quite well. Thank you Jon. Thorough and on point as usual. Honored and grateful to have been able to contribute to your in-depth review and hopefully others feel the vibe and get out and enjoy our shared favs! Cheers bro. Great review Jonathan. I toured on the 2016-17 Ravens, 184cm with Kingpins last season. And I did get them out on some steep firm snow in the couliors of the Sawtooths. We did a four day hut trip out there with some pretty terrible snow. On the firm and steep north facing couloirs, the Ravens did great, easy and predictable like you described. We also skied two days of the worst breakable crust I have ever ridden. In those conditions, the semi pintail/long tail taper of the Ravens kind of sucked. It would lock the back half of the ski below the crust, making it almost impossible to turn. Now it’s important to note that I wasn’t the only one with this problem, even the guides were falling in these conditions. Still, it makes me wonder… what if the Raven had a little fatter tail, and/or shorter length of tail taper? Would it ski crust even better? It probably wouldn’t ski pow as well, but that would be a trade off I would take. P.S. Sterbenz, please make the Devastator in a 189cm goldilocks size!!! It’d be the best resort ski EVAR!!! First of all, I really need to get out to the Sawtooths. Second, thanks so much for the feedback. Very interesting. And yeah, it’s hard to say how much better you would have fared on breakable crust if the Raven had a fatter tail. In my experience – and given that the tail taper on the Raven is pretty subtle – I am more inclined to blame the low weight and width of the ski. On breakable crust (which as you note is pretty horrible on all skis), I’d want something heavier and wider and with a ton of tip and tail rocker — get the tails far away from that crust. And in this sense, the DPS Lotus 138 is a pretty good breakable crust ski — your on a wide platform underfoot – basically standing on a wide disc – with super heavily rockered (and tapered) tips and tails that won’t sink or catch – the tips and tails tend to stay above the crust the whole time. So I’m not entirely sure that widening the tail of the Raven would really alter its performance on breakable crust. If you left all other variables the same, I’d think you’d mostly just want to rocker its tail even more – that doing so would have a more significant impact on breakable-crust performance. But thanks be to god, I don’t spend *that* much time skiing breakable crust, so I’m not certain that I’m correct about this. Mostly, screw you, breakable crust. First, thank you for a great review! After a winter skiing the 184s I can completely agree your assesment of the ski. But since I got the skis I have always been wondering how they compare to the Hojis for touring. The 179 hojis weigh about the same as the 184 ravens, so wight is not an issue. I initially went for the Ravens because I tried to be realistic about what snow conditions I would encounter (Norwegian coastal touring), but my experience the past year is that a wider Hoji would probably do just as good in most conditions, espescially in refrozen crust an deeper powder. I have not skied the hojis, so I cannot say for sure. Do you have any possible insight regarding this comparison? Where would you pick the one over the other? Would it be safe to say the Hoji 187 is just a fatter more powder oriented Raven 184 given the similarities in construction and shape? Any plans to review the new Hoji? This is precisely what we’re wondering, George. 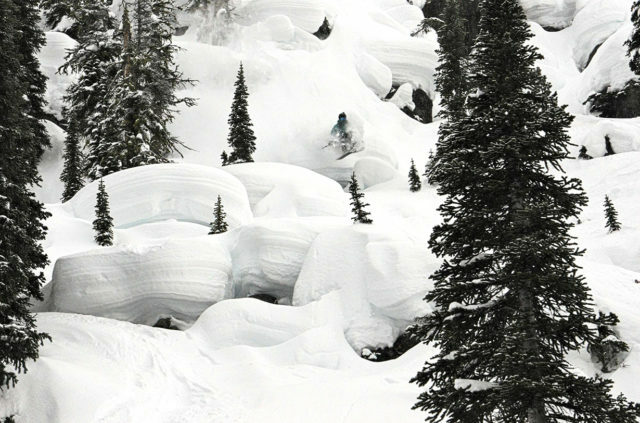 We only skied the Hoji back in 2012, and that ski definitely did not simply feel to me like a wider, current edition of the Raven. So yes, we do hope to get on the current Hoji soon. But in a few hours, I’m going to be talking to Hoji about the Hoji, so I’ll ask him and get his take on this question. And that podcast will hopefully go live tomorrow. 4Front has summer sale not sure for how long with the 2 Co’s coming together….J SKIS & 4Front….great podcast a few weeks ago with 2 pioneers of the ski industry hosted by JE. Love how detailed your reviews are, and that you dont just take them out in perfect conditions and say that they perform well (which in my opinion, most skis do to a certain degree). My question is if there are any tall people here who have used this ski in 190? I am 198 (think that is about 6 foot 5?) and currently weight about 80 kg (probably gaining a few kg’s before the skiseason), and i wonder if they are a bit short. Used the Atomic Vantage 100 CTI last season, and i cant say im impressed with the way it handles anything but fresh pow and spring slush. Looking for a ski with 100-115 mm underfoot and preferably right under 2 kg per ski (1700 grams is too light the other way). 2 other options are Blizzard Zero G 108 and G3 zenoxide. I live in Sogndal, Norway, so they will be used for touring in chutes and crappy conditions. I’m also also really curious about how the 190 raven handles big people. Any larger humans have time on this ski? Has Paul Forward gotten ahold of a pair yet?? Hi, Carl – I’m happy to report that we are getting Paul Forward on the 190 Ravens. Might be a couple weeks before he can weigh in, but it’s happening. Any update here on the 190s Jonathan? So I’m stuck between the Black Crows Navis Freebird vs 4FRNT raven and wanted to know if anyone has a comparison. Or other recs? I’m in a market for a dedicated touring ski/ski mountaineering setup in the 95-105 range. Probably with a Tecton or Kingpin binding. I’m a big guy 6’2 215 lbs and I currently ski an Atomic Vantage 90 CTI for hard pack/groomers/east coast and Line Sick Day 110 for out west/pow days and thats also my frame binding touring setup I iused both inbounds and out. My boots are Technica Cochise. Possibly looking to get Scarpa Maestrale or something similar in the near future . I’m weery a bit based on the comments about it not being the ideal choice for steep tight lines, something I would want to explore with my next ski purchase. Hi, Raja – we haven’t reviewed the Navis Freebird, but we’d love to. And just to be clear, my specific caution was that the Raven wouldn’t be my first choice on “steep, super firm lines” – basically, on really steep ice, where traditional camber might come in handy. But aside from steep ice, I personally wouldn’t shy away from using the Raven on “steep, tight lines” – the ski is easy to jump turn and / or pivot or smear your turns. My point was that the Raven is *not* a slalom ski, so for true, laid-over carving, it needs speed. But it can pivot around in tight spaces very well. Hope that clarifies things a bit. Ahh ok thanks for the clarification. I like more traditional camber on a front side/hard pack ski, but for the intended routes I’d mostly use this on (either tight couloirs, chutes or trees) I love making hop/pivot/smear turns so glad to hear it was still solid on those. Any other skis I should add to this list as possible choices? How would you compare the Raven to the G3 Synapse 109 for pow and hard snow capability? Looks from the review that the Synapse would be a little quicker and ‘pivotier’ in good snow, but maybe give up some stability on the firm stuff? Hey Raja – which ski did you end up choosing? I’m also on the fence about the Raven. I’m the same size as you. The Navis is on my radar, as is the Line Sick Day 104 used as a touring ski (186 is 1900g and blister loves it too). For the raven, I’m not sure if 184 or 190 (actual lengths 183 and 189). I’m torn between two very different skiis that are the same length and weight, both that you love. The Raven and Sick Day Tourist in 184 and 186. What are some things you’d ask yourself to decide? I’m going to tour on them in Shifts in MT and Tahoe. They’ll see some inbounds. They are gonna be my only touring ski for now. Does one ski longer? Float better? Seem like a better all around BC ski? Also considering Sick Day 104 bc it’s longer. I like and own the Sickle and Kartel, both have progressive mounts, one flat and one camber. Desire to ski surfier and more playful but have chargey roots. Trying to stop skiing against the shin of my boot like a mad man. Hey, Taylor – these are (as you know) two of my personal favorites — and we also quite like the Sick Day 104 (Luke Koppa and Sam Shaheen have just been skiing that again over the past several days, so we’ll have an update on it soon). Given everything you’ve said, I’d rule out the Sick Day Tourist – it is (and feels) like a very good traditional ski. And you say you’re trying to get away from that. Granted, the Sick Day 104 also has a traditional mount, but it is still light enough and poppy enough that it invites a more playful style than the Tourist does. Other consideration: given your height / weight (6’4″, ~200 as I recall), and given that this is going to see some inbounds duty, I’d be pretty tempted to tell you to consider either the 190 Raven or the 186 Sick Day 104. We’ll be weighing in on the 190 Raven shortly, but I just don’t think at your size the 184 Raven is a great call – I’m 5’10, ~175 lbs, love the 184 as a touring ski, and wouldn’t be all that tempted to use it inbounds in variable-to-firm conditions. And the 186 Sick Day 104 is still a pretty light ski (for your size). Long and short, both skis will be better off in soft conditions; the Sickles will be much better on firm, I believe. So if we’re talking 190 Raven vs. 186 SD 104 … I do think the 190 Raven will float better and work better in really thick, heavy sun-baked snow. The Sick Day 104 will likely be the better call if you’re going to end up skiing a bunch of moguls inbounds, and it is also the more natural carver. I might leave it at that for now — does that help narrow things down at all? Jonathan I could kiss you. You’ve narrowed things substantially and ruled out the Tourist / Raven 184. I’m feeling like a lean toward the 190 Raven over the SD104 but this is a manageable decision for me to make (and yes, I’m 6’4 200# – good memory!). Thank you for getting into the nitty gritty with me. V curious to hear the follow up on the SD104 by Luke & Sam, as well as Paul’s take on the 190. Suspect that will help even more. So just to double check…when you say “Sickles” here, you mean Sick Day, right? –> “And the 186 Sick Day 104 is still a pretty light ski (for your size). Long and short, both skis will be better off in soft conditions; the Sickles will be much better on firm, I believe” –> aka the sick day (not the sickle) will be better on firm than the 184 Raven? (btw I picked up a lightly used pair of Sickles this season after watching used markets for years. I get it. And I sold off my Bacons consequently). Hey, Taylor – when I said Sickle … I meant Sickle – I remembered you had those, so figured bringing them in as a point of reference would be helpful. I.e., in very firm conditions, I’d still rather ski a 186 cm Sickle than a Sick Day or Raven. Ah blast it. My bad, sorry for the misread there. And yes, that point of reference is super helpful actually, thank you. The sickles killed it again today on a pretty mixed day here in montana, even at 182cm overall. I was sliding and slarving a lot today, more than usual, and kept thinking about how the flat camber was just incredibly versatile and wish more skis were like it (besides the devastator which doesnt sound like my cup of tea). I just got myself a 184 Raven on ebay and am now wondering about the mount point. I did listen to the Podcast with Hoji and I am thinking about moving at least 2cm back, maybe 3cm if Hoji is mounting them at -6 with 290mm soles? I mounted them on the line and wish i had gone back an additional 2cm. I like a more traditional mount and these are too centered for me. I´m the same height and weight as you and am also considering to get the 184 Raven as my main touring ski. How do you like it so far for touring and where did you end up mounting it? I mounted them an additional 1.5cm back. I like them in powder and in breakable crust they are better than most Skis. However any decently wide Ski is fun in powder and I usually manage to avoid breakable crust and even if I don’t it’s not like they make it great fun. Bottom line is they are not for me. Less edge contact on icey snow and when skinning, no bounce out of the turn and especially the reverse sidecut doesn’t suit my riding style – I like to be able to adjust turns with the shovel pressure but this does nothing on these. This is not to say that this isn’t a great ski for someone with a suitable riding style or maybe it’s better suited to North America (I ski only in the Alps). I found them to excel in only one category that I ski: narrow couloirs with enough snow because of the low swing weight, central mount and basically hook-free sidecut design. But it’s rare that conditions are this perfect and there is no harder sections which is why I haven’t taken them out much lately and I favour my Kästle TX98 which is great in anything up to medium speed – so it’s perfect for me as a more techincal not super-charging and maybe a bit old-school skier. I bought a set of 181 Uptrack Cols when 4Frnt had a 2 for one around New Years and am totally impressed. I have only used them at Alyeska and thought they would be a powder ski but they are more versatile than I imagined. They handle chop really well, much better than my Automatic 109s, and I can still ski in the gullies with my kids. What really impressed me is when I demoed some narrower skis when Powder Hound did a free demo day. None of the skis I tried made me want to replace the Cols. It may be my style of skiing but they really suit me and have a a similar shape to the Raven, a bit wider and a bit heavier. I may put a tour binding on them but they are pretty fun in bounds too. I’m trying to figure out a hole in my current quiver, and think the Raven might be a good fit, but I’d love a second opinion. I’m about 6′, 165lbs, and a pretty directional skier with a style that’s definitely more charger than playful. I live in the PNW. Right now I’ve got 186 Blizzard Bodacious’ as my do it all in bounds skis, and 188 Carbon Megawatts with Radical 2.0s as a powder oriented touring ski. I’d like to add something skinnier and more versatile than the BDs to tour on in less epic conditions, and maybe ski inbounds once in a while in harder snow where the Bodis don’t shine as much. Likely going to give Shifts a go on this hypothetical ski. Okay so I pulled the trigger on a pair of 184 Ravens and Shifts. Waiting for them to show up, and pondering mount point. The recommended line is a bit forward compared to my usual preference (e.g. my 186 Bodaciouses measure a true 185cm, and feel dialed mounted on the line at 81cm from the tail). Do you guys think I should try the Ravens on the line anyway, or start back a little? Should I have gone for 190s instead? I’m about 6′, 170lb, and a strong, pretty directional skier. I picked up a new pair of 2017/18 Ravens at a fall tent sail and mounted Dynafit bindings on them. I ski with Hoji’s dad and talked to Eric about where to mount the bindings. He has his own theories for guys like me with big feet (size 13). I’m 6’1” and Eric suggested mounting the bindings slightly behind the recommended boot center. It’s a complicated formula but works out to 18mm (3/4” back). I went 12mm (1/2” back) with my boot centered at 84.8cm from the tail instead of 86cm. That puts my toe closer to Hoji’s toe. But I must say that after three days touring on the Ravens I’m having trouble staying forward and the skies tend to take off. Of course, I don’t ski like Hoji, more a traditional skier but I’m still a strong skier. Maybe I’m not used to the big turn radius. Does it make sense to remount the bindings to the the recommended position? Or will that just weaken the ski? Hi, Tim – apologies for the late reply, and please say hi to Eric’s dad for me the next time you see him. Re: a 2nd mount / weakening the ski, don’t worry about putting a 2nd mount on these skis; I’d just give yourself 10 cm of space between the new holes and the old holes (or at least 5 mm of space), and you should also be able to find plugs for the old holes (though I wouldn’t say that this is necessary). That said, I’m not confident that mounting a bit more forward is going to address the issues you’re having. 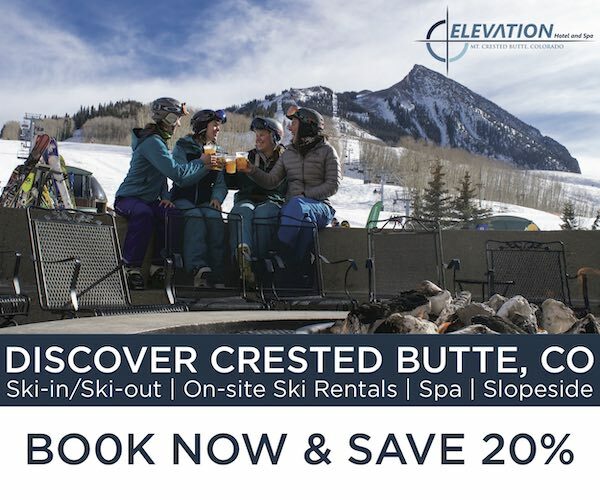 I’m also wondering whether you are coming from skis / years of skiing on skis that have a much more traditional mount point – e.g., -10, -11, -12, etc. If that’s the case, then the issues you are having so far might have more to do with its more forward mount point, so re-mounting to get even more forward would not solve the issue. Since you posted this, have you skied them more? Did you remount? As many people have discussed in this Comments section, you might want to try skiing with a more centered, upright stance rather than really getting out all over the tips of your skis and really driving the shovels (i.e., as you would with a more traditional stance). And if you are skiing in boots that have a lot of forward lean or that are very stiff or too stiff for you, that could also be contributing to the difficulties you’re experiencing. Anyway, just a few thoughts. But I’d love to hear how it’s going / if you’ve changed anything up? If you are a more traditional skier (like I am) I don’t think you will be happy on a no camber / reverse tapered ski – unless you want to learn a completely new skiing technique. I think that there are a number of skis that find a good combination of the modern advances in ski shape design and some camber/sidecut that give you the advantages of newer designs but don’t require a change in technique. I love my Kästle TX98 and the Scott Superguide or Salomon QST Explore go in a very similar direction. Disclaimer: I ski only in the alps where conditions are likely different. Do you find the lack of camber underfoot makes the skis feel a little “dead” in fresh powder? My inbound pow skis are full rocker Volkl One’s – super stable but lack some pop….not sure if its the skis or the rocker profile. Also you mentioned the skis really like fast open turns – is this true in fresh snow as well as firmer conditions? Hey, the 4frnt site shows a different rocker profile than your pictures. It looks like the flat chamber that we see in your pictures is no longer. Can you confirm this? We talked to 4FRNT about this and they said that any differences between the 16/17–17/18 Raven and 18/19 Raven would be extremely subtle as the only change was the switch in factories, rather than any changes to the design of the ski itself. Looking at the pictures of the actual ski on 4FRNT’s website (rather than the digital rendering of the rocker profile), the rocker profile still looks very similar to the 16/17 and 17/18 versions of the ski that we’ve been skiing. That said, we’re working on getting a pair of 18/19 Ravens so that we can officially measure and compare them in person. I’ve got a pair of 18/19 184s and can confirm that they’re flat underfoot. Interesting. I just bought a pair of supposed cosmetic blems, and they are not flat underfoot, but rather have some reverse camber under nearly the whole ski. I was ok w/ flat, not sure I really wanted a reverse camber ski… Hmm. Not sure what to tell you. Mine have a pretty big section underfoot that I’d call legitimately flat. Would the 184 be too long for me: 5’7″, 145lb? Strong skier, wearing Scarpa Freedom RS. Longest I’ve typically skied has been 181, but not full rockered. Looking as a dedicated touring ski with tech binders, also considering the Hoji, as I’m mostly touring for pow. Short answer / opinion – for a strong skier of your height / weight skiing a Freedom RS … no a 184 would not be too long. I’ve had a few days on the 18/19 Raven 184cm w/Dynafit Radical mounted on the line (307 BSL). I’m 6′ 180lb. Impressions: stay centered and get comfy with pivoting and these things truck and are a ton of fun. Radius: longer yes, but not twitchy as a result (def no hooking) and because of the reverse camber the ski wants you to pivot in tight spots. It loves any sort of soft snow and handles transitions to less perfect snow very well. I’ve had a lot of fun on them so far in chop, some pow, groomers, and even corn (amazing here). I can tell they are making me a better skier by the adjustments I’m being asked to make (centered, pivot, etc.). My advice: mount them where 4FRNT says to and don’t overthink it too much: Hoji is a tinkerer and an engineer and thinks (and skis) way differently than most (or all) of us. Get psyched to try a more centered position as you point your tips towards the softer snow and be rewarded with a stable, fun, nimble, and dynamic ride. With each time I ski them, I can tell the skis “oddities” are fading and they’re just outright fun and easy to play on. I agree with your sentiment, Seth. I skied the 190s with Dynafit ft12 and Dynafit mercuries at -1 (27.5 boot). 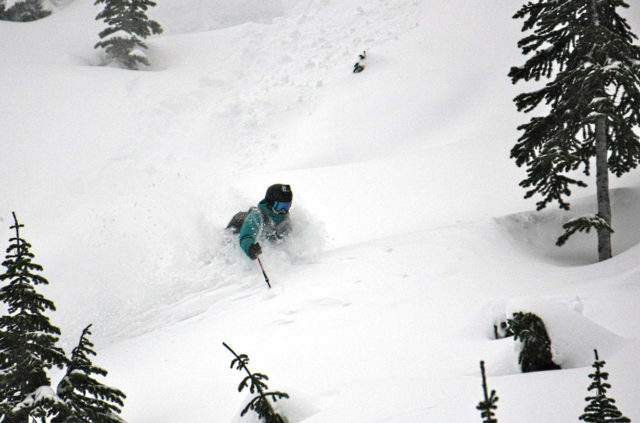 I skied for one touring day and on a 1-3” snowfall day with wind transported snow pockets, some inevitable moguls, etc. At first I had a bit of a tough time with them on my first day touring. Too much forward lean on my Dynafit mercuries. I turned and the tails would wash out. Flipped the walk mode insert to be more upright before the second day on resort. When I did that I had a few cautious runs on them, but once I got the hang of them, I was blown away. You definitely don’t lean forward on these skis or you lose your tail. But staying centered on the ski with pressure a bit back from the ball of the foot and I’ve yet to have such confidence and instant connection with a ski. The weight of the skis and boots may of helped, but these skis are unbeleivably nimble. You can pivot these things no problem to get out of a tight spot or navigate through trees. I felt like I could either use the turning radius and make long gradual turns, or if I wanted to, I could tip the skis and lean into it hard, and the ski would instantly pop off and jump to the next turn. I haven’t had that feeling of quickness or response in a ski like I have with this ski (on3p BG, On3P Jeffery, praxis 9d8), and definitely feel like it pushes you to go faster. The confidence to navigate terrain with the ski I think counteracts the need to have a heavier ski to dampen terrain, i didn’t find a limit based on weight IMO. Skiing in big rutted moguls wasn’t amazing by any means (weight + boots + touring bindings), but the quickness of the skis and the lack of turning radius made it more than tolerable to ski through it and find a less moguled up line. Certainly makes me wonder what the hoji and renegade ski like in comparison. It’s an addicting feeling. It even tempts me to throw in an alpine binding or a touring binding with an alpine heel. The ski is something else, especially given the other skis I ski, two brands that are known for the performance of their skis. I’m super excited and interested in this ski! It sounds like it fits everything I’m looking for (weight-to-ski ratiio, nimbleness, playfulness, float). I am a little nervous, however, to step into such a rockered ski. Have been on flat skis, and currently enjoying the Salomon QST 106s…How drastically different does this ski feel to you all, who own it/have ridden it? I`m 170cm, 67kg and an aggressive skier, who likes to ride fast. Jonathan, your reviews are great and I appreciate reading everything you write. After reading your review about the 4FRNT Raven and the J Ski Masterblaster, I must have both, the 4FRNT Raven for touring (at the moment I use the Volkl V-Werks BMT 94 in 177cm, which I enjoy very much) and a narrow resort ski like the J Ski Masterblaster (I use Volkl`s M4 Mantra 177cm, which I also use in deep snow, an amazing ski). What do you think about a 177cm or better a 184cm 4FRNT Raven and a 175cm or 181cm Masterblaster. I need your help. Thanks, mg, and really glad that you are finding the reviews to be useful. Re: specific lengths, I’ve skied the 184 & 190 in the Raven (but not the 177), and I’ve skied the 181 & 187 in the Masterblaster (but not the 175). But I will say that if you are 100% fine with the length and weight of the M4 Mantra in a 177, then I think you ought to go with the 181 cm Masterblaster. You’d probably be okay on the 175 cm Masterblaster, and I’d go with the 175 if the 177 M4 sometimes feels like more ski than you want or need. But if that’s not the case, go 181 Masterblaster. Re: Raven … I’m also a bit hesitant to have you drop down in length just because this ski is already quite light. Then again, if you are really happy with your 177 cm BMT 94s, you’ll probably be okay. And especially if you are concerned that the 184 Raven might make kick turns a bit trickier, I don’t think it’s a big mistake to go with a 177 Raven. (But I also don’t think you *need* to go 177 … especially if you still will be using your 94s for long tours or spring corn skiing, etc. The Raven would be your wider (and longer) touring ski for deeper snow. Thank you for your feedback. Of course, it makes sense! Concerning the length of the J Ski Masterblaster, I am not totally sure which length, because the 177cm M4 Mantra sometimes feels like more ski than I want. But I like to ride fast and aggressive and the M4. I think my main “little” problem with the 177 M4 is not the technique or my weight but my snow boot, especially because I use an old Scarpa mastrale (the first edition), which is not stiff enough to give enough pressure on the ski. I soon better change to the new Scarpa mastrale RS or Salomon S/Lab MTN or even better your recommended Head Raptor. So I will try the 175cm Masterblaster with new snow boots and the Marker Jester Pro this year and I will tell you my experience. Selling such a amazing ski should not be a problem if it is to short. The 4 FRNT Raven I should take in 184cm for deeper snow touring beside my BMT 94. Just one last question. Would it make even more sense to try to get the Moment Blister Pro 184 (at the moment sold out!) with the Marker KingPin 13 (for example) as the ultimate ski for touring and deep snow even on ice, breakable crusts and hard pack, which we often have in Switzerland? The weight never was a problem for me and I like more heavy skis.